Call Mother a Lonely Field mines the emotional archaeology of family, home and language, our attempts to break their tethers, and the refuge we take within them. 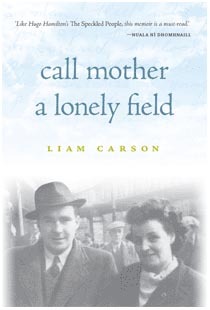 In this memoir, Liam Carson confronts the complex relationship between a son thinking in English, a father dreaming in Irish 'in a room just off the reality I knew', and a mother who, after raising five children through Irish, is no longer comfortable speaking it in the violent reality of 1970s Belfast. We experience the author's childhood through still-present echoes of the Second World War, dystopian science fiction, American comic books and punk. At the same time he explores how language, literature and stories are transmitted ó bhéal go béal, from mouth to mouth. Only after years in London and Dublin and the deaths of his parents will he begin to heal his own fractured relationship with Irish through literature. Against this background, Carson's rediscovery of Irish as a tearmann or sanctuary is a haunting testament to the potency of our own vanishing worlds, with implications reaching far beyond the experiences of one family or city. Liam Carson is the director of the IMRAM Irish Language Literature Festival. His father, the late Liam Mac Carráin, was well known in Belfast as a postman, Irish-language activist, writer and much-loved storyteller.